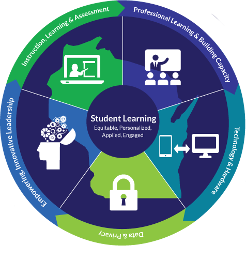 The Wisconsin Digital Learning Plan, based on elements of the Future Ready Framework, create the essential conditions for digital learning to guide planning and budgeting. Wisconsin school districts are encouraged to implement a vision for student learning aligned to the Plan's goal for equitable, personalized, applied, and engaged digital learning for all students. District collaborative leadership and ITL implementation teams are encouraged to start with reviewing the Plan Gears and resources to understand the collaborative leadership responsibilities to ensure equitable access for all students.